We do enjoy eating out! This time was to allow a ‘way ahead’ and handover discussion. 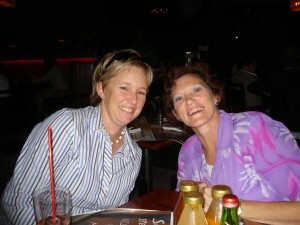 It was a meeting between our affiliate’s first South African helicopter manager (Nicole – left) and Marlene her successor. Marlene is the wife of our lead pilot Andrew Shipton. We seek to make our arrangements efficient and so we have a minimal foot print in Southern Africa. Also our affiliate needs someone to coordinate their day-to-day links there. These links are with clients, maintenance experts, insurers and when necessary lawyers. This web of links is key to the delivery of safe, flexible and efficient helicopter flying, whether of passengers or cargo. A single point of contact is the most efficient arrangement. This single point of contact they call their helicopter manager. Then they have an in-country focus for all the activity of that one aircraft. That focus allows the most flexible use of the Bell 206 Jet Ranger. Thanks Nicole for all your work on our behalf! Marlene welcome to the helicopter team. We wish you well!